Herpes zoster dermatitis has been reported to be followed by acute visual loss due to acute retinal necrosis (ARN),, optic neuropathy,, and central retinal vein occlusion (CRVO). Browning et al. have reported a period of 5 days to 3 months between skin infection and ARN. Biswas et al. reported a patient with no light perception 4 days after a VZV dermatitis presenting with an acute optic neuropathy with CRVO. Here, we describe an immunocompetent child developing an acute visual loss secondary to a combined central retinal artery occlusion (CRAO) with CRVO following an episode of herpes zoster dermatitis. 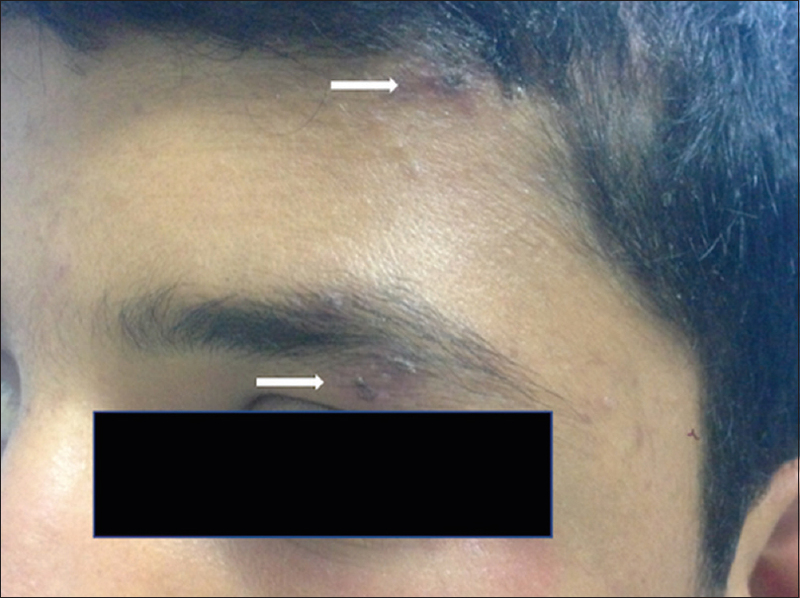 A 15-year-old healthy boy presented with loss of vision in left eye since about 15 h. He had vesicular lesions on the left side of his forehead and upper eyelid (suggestive of herpes zoster infection), which had erupted 10 days earlier [Figure 1]. The right eye was normal. Left eye had hand motion vision, intraocular pressure 10 mmHg, a relative afferent pupillary defect, optic disc edema, dilated and tortuous veins, and multiple retinal hemorrhages [Figure 2]a. Fluorescein angiography revealed extremely sluggish blood flow in the arteries, delayed venous filling suggesting a combined CRAO with CRVO, and frosted branch angiitis in the posterior pole [Figure 2]b. Optical coherence tomography revealed massive retinal thickening, intraretinal, and subretinal fluid that precluded identification and differentiation of retinal layers [Figure 2]c. Given his history of VZV dermatitis and rapidly progressing visual loss, intravenous acyclovir was begun. The next day, he spoke of no light perception in the left eye. A VZV optic perineuritis was suspected on MRI [Figure 2]d. Intravenous methylprednisolone (for 3 days) was started, followed by oral prednisolone. Complete blood count, erythrocyte sedimentation rate, lipid profile, serum homocysteine, protein C, protein S, HIV, tuberculin skin test, Computed tomography (CT) chest, Treponema pallidum hemagglutination test, herpes/toxoplasmosis serology, antinuclear antibody, p-ANCA, and c-ANCA were normal. Cerebrospinal fluid analysis was negative for tuberculosis, HSV, VZV, toxoplasmosis, and Cryptococcus. Intravitreal bevacizumab was injected during follow-up as a mild vitreous hemorrhage was observed, followed by panretinal photocoagulation. Viral Polymerase chain reaction (PCR) (HSV, VZV, and CMV) of aqueous tap was negative. Oral corticosteroids were tapered and stopped after 3 months. At 6 months, oral acyclovir was continued in the maintenance dose, the right eye remained uninvolved, and the left eye vision remained dark with no light perception. Central retinal vascular occlusion due to herpes zoster has been reported in association with ARN, either presenting along with ARN or, rarely, preceding ARN as the initial presenting sign.,,, A combined CRAO with CRVO has also been reported to be associated with ARN in the same eye, or herald ARN in the fellow eye. Certain risk factors have been identified in these patients such as ARN, elderly patient, preexisting cardiovascular disease, and AIDS.,,, Our patient had none of these systemic/ocular risk factors. In the absence of any intraocular signs of inflammation (such as vitritis, retinitis, or vasculitis), negative PCR from vitreous fluid, atypical presentation, and a negative laboratory workup, this case posed a significant diagnostic and therapeutic challenge. Although there was no definite evidence of CRVO, the possibility was considered due to the presence of extensive retinal hemorrhages and macular edema with dilated and tortuous veins. The clinical presentation of VZV dermatitis provided the only diagnostic clue in this case in the absence of definitive tests. Optic neuropathy and/or central retinal vascular (arterial or venous) occlusion secondary to herpes zoster infection is often associated with profound visual loss leading to no light perception.,,, However, given the potential for an impending ARN in these challenging cases, prompt antiviral, and anti-inflammatory therapy is warranted. Failure of prompt antiviral therapy to restore vision, as was seen in our case, may be attributed to herpes zoster optic neuritis at the initial onset., All tissues within the retrobulbar part of the optic nerve (meninges, pial septae, and central retinal vessels) have been shown to be affected with granulomatous inflammation (suggestive of vasculitis) in enucleated eyes with herpes zoster ophthalmicus. This could explain the extensive inflammation around the optic nerve in our patient as seen on MRI. Ischemic or compressive optic neuropathy has also been implicated in causing severe visual loss in herpes zoster ophthalmicus. Association of herpes zoster optic neuropathy with CRAO corroborates ischemic mechanism, leading to severe visual loss. Our case was quite unusual with a severe, combined CRAO with CRVO, and sudden loss of vision following herpes zoster dermatitis in the absence of any intraocular inflammatory signs in a healthy immunocompetent individual. Although vision could not be restored in the affected eye, it is likely that a prompt and an intensive antiviral therapy could have prevented the onset of ARN in the affected/fellow eye, thereby avoiding its sequelae. Yeo JH, Pepose JS, Stewart JA, SternbergPJr., Liss RA. Acute retinal necrosis syndrome following herpes zoster dermatitis. Ophthalmology 1986;93:1418-22. Browning DJ, Blumenkranz MS, Culbertson WW, Clarkson JD, Tardif Y, Gourdeau A, et al. Association of varicella zoster dermatitis with acute retinal necrosis syndrome. Ophthalmology 1987;94:602-6. Friedlander SM, Rahhal FM, Ericson L, Arevalo JF, Hughes JD, Levi L, et al. Optic neuropathy preceding acute retinal necrosis in acquired immunodeficiency syndrome. Arch Ophthalmol 1996;114:1481-5. Kang SW, Kim SK. Optic neuropathy and central retinal vascular obstruction as initial manifestations of acute retinal necrosis. Jpn J Ophthalmol 2001;45:425-8. Biswas J, Deka S, Padmaja S, Madhavan HN, Kumarasamy N, Solomon S. Central retinal vein occlusion due to herpes zoster as the initial presenting sign in a patient with acquired immunodeficiency syndrome (AIDS). Ocul Immunol Inflamm 2001;9:125-30. Yeh S, Fahle G, Flaxel CJ, Francis PJ. Central retinal vascular occlusion associated with acute retinal necrosis. Arch Ophthalmol 2012;130:514-7. Shah SP, Hadid OH, Graham EM, Stanford MR. Acute retinal necrosis presenting as central retinal artery occlusion with cilioretinal sparing. Eur J Ophthalmol 2005;15:287-8. Litoff D, Catalano RA, Albary NY. Herpes zoster optic neuritis in HIV infection. Arch Ophthalmol 1990;108:782-3. Hedges TR 3rd, Albert DM. The progression of the ocular abnormalities of herpes zoster. Histopathologic observations of nine cases. Ophthalmology 1982;89:165-77. Atmaca LS, Ozmert E. Optic neuropathy and central retinal artery occlusion in a patient with herpes zoster ophthalmicus. Ann Ophthalmol 1992;24:50-3.